Essential oils smell wonderful, but did you know you can use essential oils for cleaning? They make terrific anti-bacterial and all purpose cleaners. Use essential oils for cleaning bathroom. Use essential oils for cleaning wood floors. You can add oils to your laundry for fresh smelling clothes. Use essential oils for cleaning counters, walls, and your shower. Orange oil (get it here) has a lovely citrus scent and is great for cutting grease. Use orange essential oil for cleaning and removing grease from dirty pots and pans. Add 1-2 drops directly to the pan, fill with hot soapy water and allow to soak for 10 minutes. Scrub to remove remaining grease and rinse. Use orange essential oil to clean stove tops and counter tops. Mix 12 drops with 1/4 cup castile soap and water in a spray bottle. Spray and wipe as needed. Use orange essential oil for cleaning your floors. Add 25 drops to 1 gallon hot soapy water, and mop as usual. Use orange essential oil for cleaning the air in your home. Add 15 drops orange oil, 10 drops rosemary, and 10 drops lavender to a spray bottle with 1/4 cup of rubbing alcohol. Spray into the air as needed. Use lavender essential oil for cleaning your tabletops. Add 15 drops to 1/2 cup of white vinegar in a glass spray bottle. Spray, allow to set for 5 minutes, then wipe off. Lemon essential oil (get it here) has a fresh, clean scent and is a powerhouse for homemade cleaning agents. It is antibacterial and antiviral. Use lemon oil for cleaning and degreasing the top of your stove. Add 10 drops to 1/2 cup of baking soda and allow to sit for 30 minutes. Gently scrub to remove remaining stains, and rinse. Use lemon essential oil for cleaning and deodorizing your fridge. Use lemon essential oil for cleaning your floors. Add 30 drops into a gallon bucket of hot, soapy water and mop as usual. Use lemon essential oil for cleaning and polishing your wood. Add 10 drops to 1/2 cup olive oil and make a natural wood polish. Rosemary (get it here) has natural antibacterial and antiseptic properties. Use Rosemary essential oil for cleaning laundry. Get the recipe for homemade laundry soap here. Use rosemary essential oil when you need to stay focused. Combine 3 drops peppermint and 3 drops rosemary oils and diffuse. Tea Tree Oil (get it here) is pretty versatile. It fights germs, bacteria, and viruses. Use tea tree essential oil for cleaning your shower. Add 15 drops tea tree oil to a spray bottle with 1/2 cup water and 3 Tablespoons castile soap. Spray and scrub as usual. Rinse throughly. Peppermint oil (get it here) has a cool, invigorating scent and its antibacterial properties make it a great addition to any type of spray cleaners. Use peppermint essential oil for helping to deter ants and spiders. Mix 45 drops of peppermint oil with 1 cup of rubbing alcohol in a spray bottle. Shake well and spray it along any cracks and crevices in your home where you see bugs. Eucalyptus (get it here) is a natural germicide and dust mite buster. Use eucalyptus essential oil for cleaning your mattress. Mix 10 drops with 1/2 cup baking soda, sprinkle over the entire mattress, then vacuum. Use eucalyptus essential oil as dry wash for stuffed animals. Mix 3 drops to 1/2 cup rubbing alcohol in a spray bottle. Lightly spray the stuffed animals and allow to dry. Use eucalyptus essential oil for cleaning cupboards. Add 25 drops to 1/2 cup rubbing alcohol in a spray bottle. Spray cupboards lightly, and allow to dry. This can help deter pests. Essential oils have wonderful smells and antibacterial/antiviral properties. 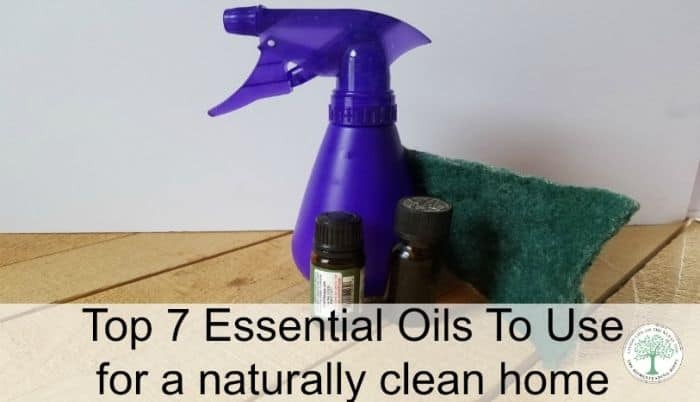 It’s so easy to use essential oils for cleaning! Do you use essential oils for cleaning? What’s your favorite cleaning recipe? Be sure to pin this for later!